Sant Miquel de Balansat, a small village in the municipality of Sant Joan de Labritja, celebrates the religious festivity of Maundy Thursday, during the Holly Week, with the traditional "Processó des Passos" (scenes from the Passion). Of a medieval origin, the procession leaves the ancient parish, situated on a hill that dominates all the village, and descends to the village centre via the recently restored stone steps. 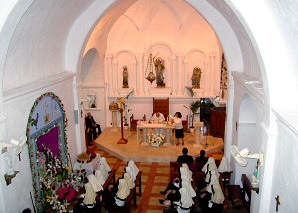 The event, in which nearly the entire village participates, excels for the chants by a group of youngsters who stop at each station of the cross, forming a circle, for the group of young ladies covered with the mantillas who support and accompany the image of La Dolorosa, and for the group of young single men who bear the statue of Crucified Christ. Sant Miquel de Balansat is one of the villages of Eivissa that preserves their festive traditions best. The procession of Maundy Thursday, and the patron saint fiestas and folk dances that are held during the summer, are good examples of this.